Bargain and sale from John Jackson and John Hemynge of London, Gents., and William Johnson, vintner of London, trustees of William Shakespeare, deceased, to John Greene of Clements Inn and Matthew Morryes of Stratford-upon-Avon, Gent., trustees for the heirs of William Shakespeare [manuscript], 1618 February 10. Title: Bargain and sale from John Jackson and John Hemynge of London, Gents., and William Johnson, vintner of London, trustees of William Shakespeare, deceased, to John Greene of Clements Inn and Matthew Morryes of Stratford-upon-Avon, Gent., trustees for the heirs of William Shakespeare [manuscript], 1618 February 10. The two new trustees were John Greene of Clement’s Inn, brother of Thomas Greene, the Stratford town clerk; and Matthew Morrys of Stratford-upon-Avon. The explicit purpose of the transfer was to secure the property to Shakespeare’s daughter Susanna, wife of Dr. John Hall. One possible motive for transferring title to two new trustees instead of directly to Susanna or to John Hall was to forestall a challenge from Shakespeare’s wife Anne, who was still alive at the time of Shakespeare’s death in 1616 (Anne died in 1623). Regardless of the trusteeship, in the case of Susanna’s demise the property would go to any of her male heirs; then to male heirs of her younger sister Judith Quiney; and in the case of Judith’s demise, to any male heir of William Shakespeare whatsoever. 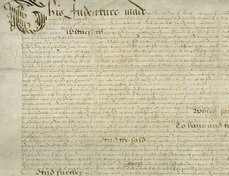 Like the original 1613 indenture of bargain and sale, the 1618 indenture consisted of two essentially identical copies, written out on a single sheet of parchment, then signed and sealed, and finally cut apart along a wavy line. The document shown here is the copy signed by the vendors William Johnson, John Jackson, and John Heminges. The copy signed by the buyers John Greene and Matthew Morrys is not known to survive. Halliwell-Phillipps owned this document and published a transcription in 1887 (Outlines, ii, 37-41). In his discussion of the document, Halliwell-Phillipps planted a seed of doubt concerning one of the signers: “Amongst the [trustees] was one described as John Hemyng of London, gentleman, who signs himself Heminges, but it is not likely that he was the poet’s friend and colleague of the same name” (Outlines, i, 239). The signature on the present document, however, exactly matches the signature of John Heminges in the archives of his parish church of St Mary Aldermanbury (London Metropolitan Archives P69/MRY2/A/001/MS03572/001). Thus John Heminges the trustee was Shakespeare’s fellow in the King’s Men beyond all reasonable doubt. According to notations at the conclusion of the text and on the reverse (“dorse”) of the document, this copy was drawn up by Richard Tyler. Evidently John Prise collected the three signatures, which are further attested by Richard Swale (for John Jackson), Nicholas Harysone (for William Johnson), and Matthew Benson (for John Heminges). An additional endorsement, signed by Matthew Benson and John Prise, testifies that John Robinson (“tenant of the premysses”) gave John Greene six pence to be paid to Susanna Shakespeare Hall “in name of attornement” – probably to guarantee Robinson’s continued right to occupy the property. Albany Wallis, a London lawyer, owned this document as of March 1796; it also went up for auction in 1865. Wallis apparently discovered it and the 1613 indenture signed by the buyers, among a bundle of deeds of title in the collection of the Rev. Mr. Fetherstonhaugh (pronounced Fanshaw) in 1768. This document was acquired by Henry Folger along with the 1613 indenture of bargain and sale signed by Henry Walker. Hemynges and William Johnson vnto one John Robynson now tennant of the said premisses. for the terme of certen yeres yet to come and vnexpired as by the same whereunto relation be had at large doth appeare. In witnes whereof the parties aforesaid to theis presente indentures have interchaungeably sett their handes and sealls. Yeoven the day and yeres first above written. (signed) Jo: Jackson. John Heminges. Wm. Johnson. 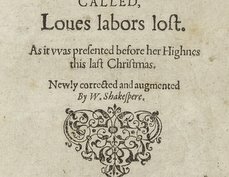 For more about Shakespeare’s purchase of the Blackfriars, please see Alan H. Nelson and the Folger Shakespeare Library staff’s essay. James Orchard Halliwell-Phillips, Outlines (1887): 1:238-40, 2:37-41. James Orchard Halliwell-Phillips, Outlines (1889): 2:37-41. E.K. Chambers, William Shakespeare: a Study of Facts and Problems (1930): 2:154-9, 168. J. Leslie Hotson, Shakespeare’s Sonnets Dated, and Other Essays (1949). 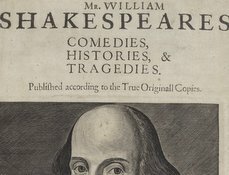 B. Rowland Lewis, Shakespeare Documents: 2:435-48, 467-71, 531-4. Samuel Schoenbaum, William Shakespeare: A Documentary Life: 220-6. Samuel Schoenbaum, William Shakespeare: Records and Images: 39-48. Lois Potter, The Life of William Shakespeare: A Critical Biography (Chichester: Wiley-Blackwell, 2012): 408-409. Frederick C. Wellstood, Catalogue of the Books, Manuscripts, Works of Art, Antiquities, and Relics Exhibited in Shakespeare’s Birthplace (Stratford-upon-Avon: Trustees and Guardians of Shakespeare’s Birthplace, 1937): 38-39. J.O. Halliwell-Phillipps, A Facsimile of the Deed and Bargain of Sale of Shakespeare’s Blackfriars Estate… (Brighton: J.G. Bishop, Printed for Private Circulation Only, 1884): 5-6. London Metropolitan Archives, Shakespeare and London : A Free Exhibition at London Metropolitan Archives from 28 May to 26 September 2013... (London: London Metropolitan Archives, 2013), pp. 3-4. Heather Wolfe et al. 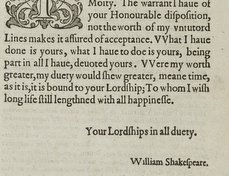 The Pen’s Excellencie : Treasures from the Manuscript Collection at the Folger Shakespeare Library (Seattle: University of Washington Press, 2002): 73-74. Mark Eccles, “Elizabethan Actors II: E-J, ” N&Q (1991), 457, note 17. Folger Shakespeare Library. Acquisitions archives.